As per the needs and demands of our customers, we are providing totally customized array of Rigid Media Cooling Pads. 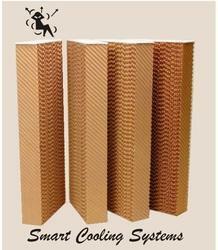 These Rigid Media Cooling Pads are available in 5 mm and 7 mm flute height. Also, offered product is available in sizes up to 600 mm wide and 600 mm thick with customized heights. 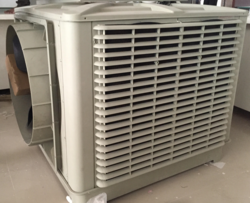 Moreover, it is effective for cooling, humidification and filtration applications. Exhaust Systems for kitchen and generator exhaust to clean the air before exhausting to ambient available in capacities upto 85000CMH in double bank nozzle design and /or rigid media design. Fresh-Filtered-Clean-Cool air is pumped in the Kitchen by our Smart Cooling M/c. Then through the kitchen hood the hot air, Smoke, odour is exhausted. The exhausted air is pulled into the kitchen scrubber which first filters the smoke, removes the smell/odour and then cleans the air of the smoke/colour etc. Finally the Clean-Filtered-Odourless air is pump into open air. This is as per latest pollution norms. With the support of our professionals, we are able to present Belt Driven Axial Fans of slow speed. On the other hand, we offer these Axial Flow Fans to our customers in various capacities started from 10, 000 CMH to 34, 000 CMH at up to 50 Pascal. 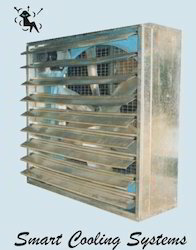 Further, our Axial Flow Fans are suitable for fan-pad, push-pull, and supply and exhaust applications. 2.A WIDTH/ INCH 730/30" 940/38" 1060/43" 1150/46" 1380/56"
2.B DEPTH/INCH 420/17" 420/17" 420/17" 420/17" 420/17"
2.C HEIGHT/INCH 785/32" 940/38" 1060/43" 1150/46" 1380/56"
3. A DIAMETER MM/INCH 600/24" 760/31" 915/37" 1050/42" 1250/50"
We are into presenting a huge varity of Air Washers to the customers with total quality management. Offered products consists of GI, SS 304, FRP or 3mm Ms. These Air Washers are available in various capacities that started from 2,000 CMH to 3,00,000 CMH with adiabatic efficiencies from 60% to 99%. Also, these are ideal for industrial, commercial and institutional applications. 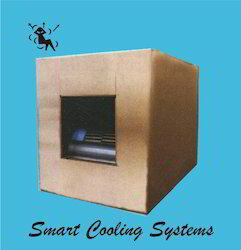 Looking for Smart Cooling Systems ?